﻿Zola’s call for realism in the theatre in the late nineteenth century included a demand for new styles of acting equal to the task of depicting new kinds of characters—“common people who permit themselves to be the center of drama round their oilcloth-colored table.” Like the many teachers and students of realist acting who followed in his wake, Zola desired performers who “shall not appear to be ‘acting’ but ‘living’ before the public.” This demand to reduce the seeming distance between art and life has always animated realist acting technique, but has also been a source of political, philosophical, cultural and technical debate whenever realism has come to the forefront as a performance ideal (for instance, at the Moscow Art Theatre, New York’s Group Theatre, and in American cinema of the post-Second World War period). 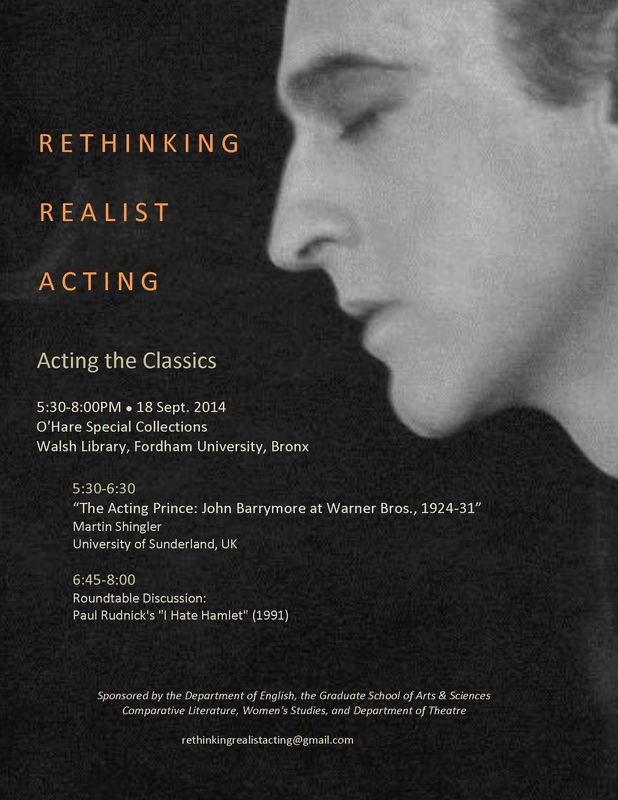 We are interested in the ways that certain historical, cultural, artistic and psychological assumptions have underpinned the constructions and receptions of realist acting in the modern period. This select colloquium brings together a group of academics and practitioners to identify, explore and challenge some of those assumptions, and to open up a conversation with the goal of enriching our understanding of realism and its alternatives. Cynthia Baron is Professor of Theatre and Film at Bowling Green State University. She is the co-editor of More Than a Method: Trends and Traditions in Contemporary Screen Performance (2004) and (with Sharon Carnicke) Reframing Screen Performance (2008). Her most recent book is Appetites and Anxieties: Food, Film, and the Politics of Representation (2013). Sharon Marie Carnicke is Professor of Theatre and Slavic Languages and Literatures at the University of Southern California. Her groundbreaking book, Stanislavsky in Focus, is now in its second edition. Her other published works include Anton Chekhov: 4 Plays and 3 Jokes (2010), numerous studies on film acting including Reframing Screen Performance which is co-authored with Cynthia Baron, and most recently Checking out Chekhov (2013). Rosemary Malague is a senior lecturer in the Theatre Arts Program at the University of Pennsylvania. She is the author of An Actress Prepares: Women and "The Method" (2012); her other work on the intersections of realism, feminism, and acting includes "Stanislavsky's System and Women" in The Routledge Companion to Stanislavsky, and "Theatrical Realism as Feminist Intervention: Katie Mitchell's 2011 production of A Woman Killed with Kindness" in Shakespeare Bulletin. She is currently working on a feminist scene book for student actors. Sharon Marcus is Dean of Humanities and Orlando Harriman Professor of English and Comparative Literature at Columbia University. She is the author of Between Women: Friendship, Desire, and Marriage in Victorian England (Princeton, 2007) and she is currently writing a book about theatrical celebrity in the nineteenth century. Stuart Sherman is a Professor of English at Fordham University and the author of Telling Time: Clocks, Diaries and English Diurnal Form, 1660-1785 (1997). He is currently at work on a book entitled News, Plays, Days: Rhythms of Performance and Report, London 1620-1779. Jacob Gallagher-Ross is an assistant professor in the department of theater and dance at the University of Buffalo, SUNY. A contributing editor of Theater, his writing has appeared in TDR, PAJ, Theaterforum, Theater, Canadian Theater Review and The Village Voice. He was a guest co-editor of Theater's 2012 special issue on "Digital Dramaturgies" and is currently at work on a book entitled Re-Enchanting the World: American Theaters of the Everyday. SHONNI ENELOW is an assistant professor of English at Fordham University. She is completing a book on American Method acting, titled Method Acting and Its Discontents: On American Psycho-Drama (forthcoming from Northwestern University Press). She is the co-author, with Una Chaudhuri, of a book on post-humanist theater, Research Theatre, Climate Change, and the Ecocide Project (Palgrave Macmillan, 2014), and has recently published articles in Theater and Theatre Survey. She also writes for performance. KERI WALSH is an assistant professor in the Department of English at Fordham University. She is currently completing a monograph called Acting Like a Hustler: Method Acting, Gender, and the Hollywood Film. Her work has appeared in Critical Inquiry, PMLA, Eire-Ireland and the British Film Institute’s Film Stars series. She is the editor of The Letters of Sylvia Beach (Columbia University Press, 2010) and James Joyce’s Dubliners (Broadview, forthcoming 2014). MARY LUCKHURST is Professor of Artistic Research and Creative Practice at the University of Melbourne. She is Honorary professor of Theatre at the University of York (UK) where she co-founded the Department of Theatre, Film and Television. Her most recent book is Theatre and Ghosts (2014) and her book on Caryl Churchill (Routledge) appears in 2015. The Program in Women's Studies at Fordham University. 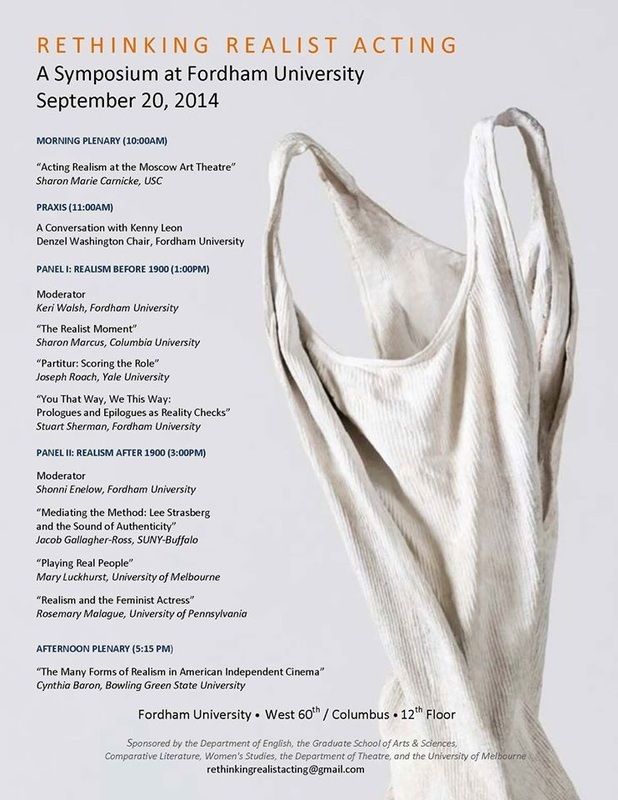 The conference will take place Saturday, September 20, 2014 at Fordham University's Lincoln Center campus. Located in the heart of Manhattan, the Lincoln Center campus is easily accessible by public transportation (take the A, B, C, D or 1 train to 59th St./Columbus Circle).